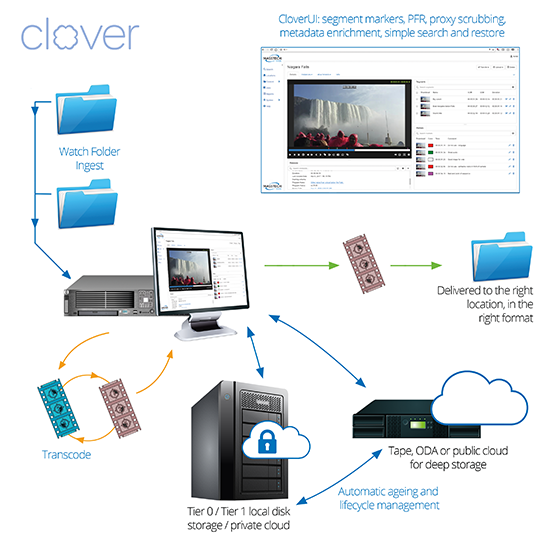 At NAB 2019, Masstech (Booth SU3710) is launching Federated Search for its MassStore media object framework, and Clover, a turnkey content suite that bridges the gap between content storage and content management. Federated search is a new feature that enables Masstech users to locate and retrieve assets stored across multiple Masstech systems wherever in the world those systems might be physically or virtually located. Visitors to the Masstech booth can see how Federated Search makes true global content sharing a simple reality, even when using disparate production and Media Asset Management (MAM) systems. This new ability to locate and retrieve content from physically or virtually disparate locations is not the only feature of Federated Search that has broadcasters excited. Masstech is also introducing Clover, a new, comprehensive content suite that bridges the gap between content storage and content management for video-centric organizations that are not looking to implement enterprise-level MAM and content storage systems. Clover is a unique, all-in-one solution that offers ingest, storage, transcoding, a configurable workflow engine, content lifecycle management, and a simple UI with a full broadcast toolset and a budget-oriented price tag. Clover comes with pre-defined tape or cloud-based storage, integrated transcode and user-customizable workflows that allow users to automate content processing and delivery into multiple formats. Clover also has a simple, intuitive user interface with integrated media player that allows users to archive, view proxies, scrub, mark in- and out-points. It also enables partial file restore, and embed content with enriched metadata that enables users to find their assets quickly and retrieve them with one click.